Mayones Guitar: The Duvell Qatsi Does a Perfect Guitar Exist? New players often say things to me like “I don’t think I’ll ever be as good as (insert their favorite player) no matter what I do. I’m not that talented”. Now don’t get me wrong, talent is always a factor in a great musician, but we seem to forget that these guys (and gals) have spent years of their life sitting in their bedrooms practicing. Often the word practice is enough to make budding players cringe because practice isn’t fun right? I disagree. Practice can certainly be frustrating if you are working on something particularly difficult, but the reward is always worth the struggle. But I digress; let’s look at some ways to make practice more productive and more importantly, fun! Practice only seems like a chore if you treat it like one. Remember that first time you played “Smoke on the Water” and felt like a rock star? Keep those kinds of accomplishments in mind when you practice something new. I find the best way to keep track of your accomplishments and stay encouraged is by setting goals for yourself. Not in terms of time spent, but in knowledge gained. For instance, instead of saying “I’m going to practice 1 hour every day this week”, say “I’m going to learn to play the rhythm part to this song this week.” As you check off goals on your list, keep up with the list of things you accomplish. Keep a notebook or a word document on your computer that reminds you what you have done. Keeping up with the list of songs you know is a great idea for the future, should you ever decide to join a group that does cover tunes. You can immediately say with confidence: “I know all the songs on this list.” It makes that first rehearsal a lot more manageable. 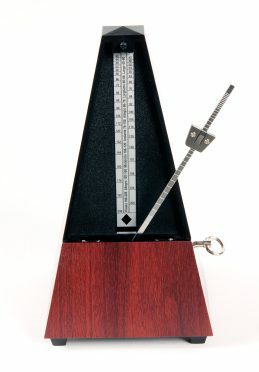 Metronomes don’t seem hugely exciting, but it is absolutely THE most important tool for a guitar player who wants to play with other musicians. Rhythm is paramount to a great sounding band and it’s very easy to train! Go buy a metronome from your local music store for $20.00. It doesn’t need to be anything fancy, just something that can keep a steady beat. When you practice a scale, pick a note group (let’s say quarter notes) and play that scale in quarter notes up and down 3 times. Then do the same thing with eighth notes, sixteenth notes, etc. As you practice the scale, you are training your ears to recognize beats at the same time. The metronome works like a strength trainer by letting you start slow and then gradually work your way up. It’s a good idea to keep track of your progress in tempos as well. Even if you only manage to go up one beat per minute a week, eventually you will be considerably more fluid than you were before. The real trick here is that as you are training your ears and your chops, you are becoming more in tune with the musicality of rhythm. Nothing can really teach you “feel”, but immersing yourself in rhythm will go a long way to helping you lose yourself in the song, which in my opinion is the ultimate achievement as a musician. To be a great player, your guitar needs to be an extension of your body. Playing notes, chords and rhythms has to feel like second nature. The easiest way to do that, in my experience, is to simply keep the guitar in your hands. If you have a favorite T.V. show that you watch every week, just pick up your guitar and strum some chords while you watch. No amps, nothing fancy, just keep the neck in your hands. If you have free time, pick up the guitar for five minutes and play anything you want. If you walk by your guitar and think it looks cool on the stand, pick it up and play one scale up and down, then put it back. Essentially, you want to familiarize yourself with the instrument. Picking it up and playing should feel just like putting on a pair of shoes: you just do it and don’t think twice about it. Remember that metronome I had you buy? Turn it on to 4/4 time signature at 120 bpm and let it click for a minute. No guitar, just listen to the click. Then after you have let it sink it, pick up the guitar and try improvising something. I don’t necessarily mean a lead lick or anything in particular, so long as you keep it in tempo with the click. Noodle until you find something you think sounds cool, and then do that for a minute or two. Then try to make a slight variation on that, just change one note or add one rest somewhere. Then think to yourself “where does this want to go next?” Change keys, or play an entirely different part, so long as you stay on tempo. The idea is that you want to exercise the creative parts of your brain. The most memorable guitarists are always the ones who do something unique, so allow your mind to wander and discover something new. Half the fun of playing a musical instrument is that there is no wrong answer. No matter what, do not let playing your instrument stress you out. Even if you have been working on learning something for a year and you haven’t figured it out, don’t let it bother you. If you are having trouble with something in your life, let guitar be a relaxing activity to take your mind off of it. If you are having difficulty learning something on the guitar, just leave it and come back to it later. In fact, if it ever feels like your instrument is unpleasant to play, then just put it down and don’t even look at it for a few days. Your brain needs time to process things you learn and commit them to long term memory, so it is ok to take a break! I hope these five tips help you on your journey of musical discovery. Remember to be patient with yourself and above all, have fun!